Suitable for tractors from 50 to 90hp especially orchard type tractors. Suited for grass, vegetable topping, vegetation and pruning’s up to Ø 50mm. Ideal for clearing green areas, slopes, ditches, banks on watercourses and road side banks. Gearbox located outside side drive for additional offset. Chamford body profile outer front corner. Floating/fixed Cat. 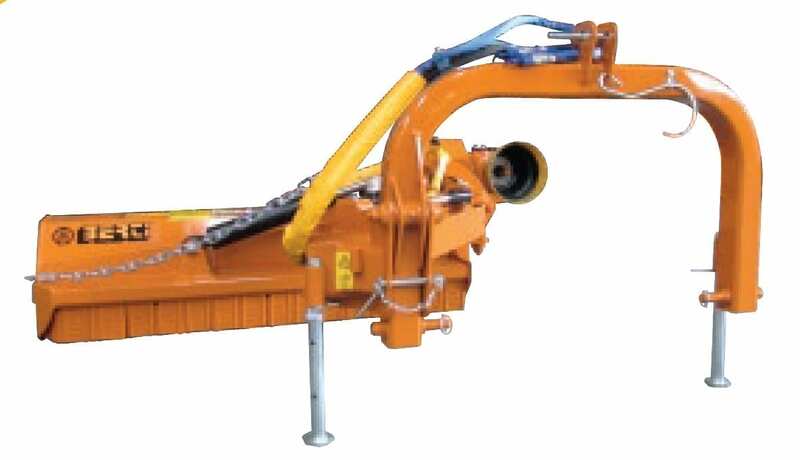 II, 3-point linkage hitch with safety lock. Hydraulic side shift with breakaway valve. Hydraulic cylinder for head positioning with floating link and safety valve. Height adjustable self-cleaning levelling roller Ø 139mm. Forged and hardened BERTI hammers type “P”. Double wide angle PTO driveshaft (1”3/8 6 spline). * The tractor has to be equipped with 2 double acting remotes.